From the teachers we hire to the welcoming and safe campus environment to the curriculum we teach, our configuration allows us to focus on the unique needs of children ages 3-14 without the distractions and very different social and academic pressures faced by high school students. 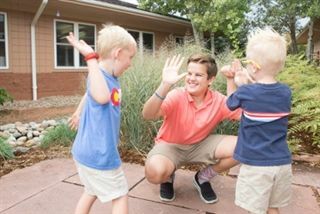 We provide a loving, nurturing, and supportive environment where children and young adolescents feel safe taking risks, developing leadership skills, exploring new activities, and challenging themselves to go further than they ever thought possible. At BCD, we celebrate children and childhood, making it a wonderful place to grow up. Balance intellectual maturation and social-emotional growth in an environment that is both nurturing and academically challenging. Know each student’s gifts and challenges and recognize individual development patterns. Offer age-appropriate activities that make it possible for children to stay children a little longer. Provide real leadership opportunities for young adolescents. At a time when they are typically feeling caught in the middle between childhood and high school, students in both our 5th and 8th grades are school leaders and role models for younger students. Mentor and model appropriate risk taking in a nurturing and supportive child-centered environment. Hire faculty who understand the developmental needs of the children they teach and who believe that the relationships they foster with their students, both in the classroom and out, are crucial to each child’s confidence and success. Develop a strong sense of community among our students and parents and allow for parent participation in many school activities. Children change dramatically in the elementary and middle school years. A high school that seemed ideal when the child was five or six may be entirely inappropriate in light of a student’s interests and abilities at age 13 or 14. By eighth grade, our students – along with their parents and teachers – understand their strengths, learning style, and interests, and are well equipped to make the right decision about the “best match” high school. We maintain strong connections with the local public and independent schools in our area as well as a range of boarding schools around the country. Each fall we host a high school fair with over 60 high school in attendance and our High School Transition Coordinator helps our families manage this important selection process. The net result is that our graduates attend public and private high schools, near and far, secure in the knowledge that BCD has prepared them well. Finally, in the spirit of school improvement and to ensure we continue to offer the best possible experience for our students, we send our alumni surveys (at the end of 9th and 12th grades) to learn from their experiences and to provide us with the data we need to make certain that each of our graduates have the opportunity to discover their excellence in high school and beyond.